Can Practo take the next big leap forward? Bengaluru: Like any other child in a household of government employees, Shashank N.D. would have given in to the glitters of a plum job. After all, the start-up wave was yet to hit the Indian shores. A golden handcuff would be reassuring in the least. A people’s person, who would be mostly spotted outside the classroom in school, either rehearsing for a play or planning excursions, Shashank did not resent the idea either. But then, that was not to be. “I ended up topping my school (National Public School, Rajajinagar) in math and computer science in class XII board exam. I studied hard in the last one year before the exams. That’s how I got into National Institute of Technology (NIT), Surathkal (in Karnataka). That is where I came to know about entrepreneurship. Till then, I didn’t even know the word," says Shashank. It was in college that Shashank came across Pirates of Silicon Valley, an acclaimed movie that documented the evolution of Apple Inc. and Microsoft Corp. A coder at heart, Shashank was intrigued. Soon, he was working on setting up an entrepreneurship cell at NIT, Surathkal. The spark that ignited the entrepreneur in Shashank was, however, an address by Ajit Balakrishnan, founder of Rediff.com, at an event organized by a business school in 2006. He recalls how the audience, turned off by jargon-laden speeches by corporate executives, snapped to attention when Balakrishnan took the podium. “He spoke almost the same things, but he spoke with such simplicity, not using jargon and stuff, just common sense. That’s when I realized that common sense and simplicity play a big part. You can build really good companies being simple and running businesses with common sense," says Shashank. Abhinav Lal, co-founder of PractoTechnologies. “Then I started following many more entrepreneurs. Their personality started to appeal to me. They were problem-solving oriented, simple in their approach. I wanted to think like them and not as part of a small cubicle in a big company. It didn’t matter if it was a small office and not a beehive. I think that hooked me on to entrepreneurship," he adds. In another two years, while still in college, Shashank would set up Practo with Abhinav Lal, another NIT Surathkal alumnus. Simplicity and common sense, Shashank maintains, are the cornerstones of Practo, which started as a practice management software provider for doctors in 2008 before launching the consumer-facing doctor discovery and appointment booking platform five years later. “The base on which we built our first product Practo Ray (the practice management software) was MATPA, i.e., marketing, appointments, treatment, payments and analytics. We had decided that MATPA will be our core offering. That simplicity was critical," says Shashank. The plan is to make Practo a global company in 5-10 years: Shashank N.D.
Keeping the product simple yet useful, launching new verticals and products while quietly shelving the ones that did not work, have made Practo the largest doctor discovery and appointment booking platform in the country and one of the few homegrown consumer internet start-ups with a global presence. It was while seeking a second opinion from doctors in the US for his father’s knee replacement surgery in early 2008 that Shashank realized that sharing medical records with doctors was tough. He wanted to create a platform where records could be stored and shared. “The idea is to make things digital. If you can make that happen, it improves efficiency and the quality of care," he says. Shashank and Lal jointly started coding a practice management software. By May 2009, immediately after the final semester of engineering, Practo had closed its first sale—to a doctor in Bengaluru. Both had decided not to take up the jobs they were offered in campus recruitments. The tough part was to convince people to join a start-up. The future stars of India’s consumer internet story—Flipkart, Myntra and Snapdeal—were still fledgling businesses and multi-hundred million-dollar funding rounds were unheard of. Unicorns such as Ola, ShopClues and Hike were not yet born. Freshdesk, the standard bearer of homegrown enterprise start-ups, would be born only a year later. Shashank and Lal, however, managed to sell their dream to five others. Siddharth Aggarwal today is vice-president (sales); Siddhartha Nihalani is vice-president (engineering); Manoj Kumar is assistant vice-president (sales); Praveen Sakrii is a senior engineering manager; and Aditya Bhat is general manager (sales and strategic accounts). “Forget being someone people would look up to. It was the opposite. People thought we could not get jobs. That’s why we did this. We had to speak to their parents to convince them to allow their kids to join our company. We made sure they had a lot of equity. Me and Abhinav (Lal) had pooled in about Rs10 lakh from family," reminisces Shashank. Practo, which commands a valuation of $600-650 million, has certainly come a long way. It is the most well-funded homegrown healthcare start-up, having raised $179 million from the likes of Sequoia Capital, Matrix Partners, China’s Tencent, Google Capital (now called CapitalG), Altimeter Capital, Belgium’s Sofina, ru-Net, RSI Fund-owned by Japan’s Recruit Holdings, Thrive Capital and Yuri Milner, the Russian billionaire and founder of investment firm DST Global. The company employs about 1,500 people and claims to aggregate 200,000 healthcare professionals, 10,000 hospitals, 8,000 diagnostic centres, and 4,000 wellness and fitness centres in India, Brazil, the Philippines, Malaysia, Indonesia and Singapore. Unlike many cash-guzzling start-ups, Practo took almost two years to raise any venture capital. Shashank says the team then focused on strengthening the product and selling as much as possible. Feedback from doctors was all-important. One such feedback, Shashank recalls, prompted the team to build an SMS reminder feature for patients, to make sure they turn up at the doctor’s chamber on time, a move he claims has improved patient turnout and brought doctors more business. By the time the first round of funds came in from Sequoia Capital—about $4 million in May 2011—Practo had acquired “a few hundred" customers and clocked “a couple of lakhs" in annual revenue. The company had operations in Bengaluru, Mumbai and Chennai. “Sequoia reached out in September 2010. Shailendra Singh (managing director at Sequoia Capital) had reached out. One of our advisers spoke to him at a networking event. What was very impressive to Shailendra was the amount of organic traction we had received. Today, a lot of our value is in the vision and the platform that we have built but back then it was the hard work of two years," says Shashank. Back then, online healthcare was unheard of in India. According to the Internet and Mobile Association of India, the country had a measly 71 million internet users in 2009, which jumped to about 462 million in June 2016. Unlike many cash-guzzling start-ups, Practo took almost two years to raise any venture capital. Between 2000 and 2008, 58 companies emerged in the practice management and hospital information management space. Of them, only three—AxSys, Yos Technologies and Insta Health Solutions, which was later acquired by Practo—raised funds from venture capital firms, according to Tracxn, a start-up tracker. “Between 2000 and 2008, there was an explosion of private healthcare across the country. We thought that in terms of physical infrastructure, an explosion happened and digital healthcare had to follow. That is when we invested in Insta Health Solutions. The hypothesis was all these clinics, dental chains, laboratories, hospitals, etc. will all need solid information technology systems, medical record systems, etc. But the uptake was extremely slow till about 2013. That is because institutions took an enormous amount of time to adapt to technology. But in 2013-14, things started turning around. There was a huge uptick in hospitals and doctors started opening up to technology. Consumers started seeking medical information on the internet. Consumers and doctors started having mobile phones and internet accessibility improved," says Rutvik Doshi, director at Inventus (India) Advisors. 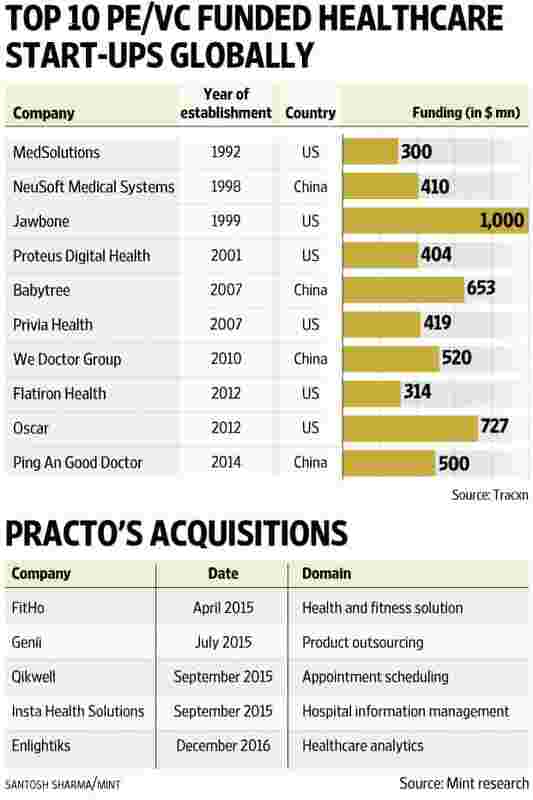 According to Tracxn, six of the 10 most well-funded healthcare start-ups globally—Jawbone, Privia Health, Proteus Digital Health and MedSolutions in the US, and Babytree and Neusoft Medical System in China—were set up before Practo took off. Together, these six companies have raised $3.18 billion from investors. The top 10 digital healthcare start-ups globally, which also include Oscar and Flatiron Health in the US, and Ping An Good Doctor and We Doctor Group in China, along with the six other companies already mentioned, have together raised $5.24 billion till date, data from Tracxn shows. In March 2013, Practo launched a consumer-facing doctor discovery and appointment booking platform, Practo.com, a move that Shashank calls a watershed moment for the company. “If you look at our vision, it was always about how can we get health records on an app. So, we always wanted to be consumer focused. We happened to do B2B (business-to-business) to support the consumer end, especially since we were bootstrapped. Launching a bootstrapped business-to-consumer operation was unthinkable. Once you have funding, you have some leeway," says Shashank. Industry experts say a consumer-facing business and its huge uptake—Practo claims about 50 million appointments were booked and seven million medical records were shared between March 2016 and March 2017—has led to the surge in valuation despite fledgling revenue from the B2B business. The appointments booked and healthcare professionals listed do not necessarily translate into higher revenue. Practo neither charges doctors for listing nor consumers for booking an appointment on the platform. According to documents available with the Registrar of Companies, Practo Technologies Pvt. Ltd clocked revenue of Rs165.14 crore for the year ended 31 March 2016, as against Rs29.73 crore a year earlier. Net sales stood at Rs156 crore. Loss climbed to Rs64.61 crore from Rs12.85 crore a year earlier. However, about Rs133 crore of sales came from Practo Pte, the Singapore-based company that holds about a 93% stake in Practo Technologies, for providing “software development and support services", as against Rs23 crore a year earlier. This implies that actual business revenue grew four times to Rs23 crore as against Rs6 crore a year earlier. “The company is not getting valued based on a pure software as a service model. Certain sectors get higher valuation because the stickiness is higher. Over a lifetime, you can make a lot more money from consumers and your cost of customer acquisition keeps reducing. That was the hook. But the real deal is, if you build this over 10-15 years, you have a treasure trove of information, which has huge potential. The way Practo can leverage the data in ancillary verticals, and this is very critical and valuable data, is enormous," says Vinod Murali, deputy chief executive officer at InnoVen Capital India, a venture debt firm, which is also an investor in Practo. “Is the opportunity massive? Yes. Will it show today? Not necessarily. But are the building blocks being put in place methodically? Yes," he adds. Practo earns revenue from Practo Ray, a tablet for medical practitioners, and Practo Reach, a paid marketing solution for enterprises. The company now plans to partner with insurance firms, medical device makers and pharmaceutical companies. “One of the new aspects we want to incorporate this year is payers, i.e. insurance companies, the government and corporates, people who essentially pay for medical expenses. Insurance has been the most significant movement we have made so far. We have been evaluating options with pharma companies and medical devices firms. These are in the longer term but that is where we tend to move towards," says Shashank. Practo has been aggressively acquiring complementary businesses to tap various healthcare providers as well as to boost revenue. In December, it acquired Enlightiks Business Solutions Pvt. Ltd, a healthcare analytics solutions firm that owns a predictive clinical and computational platform called Querent, and uses Big Data analytics to provide business intelligence to healthcare providers. It claims to have about 250 hospitals and clinics as clients. In 2015, Practo acquired Insta Health Solutions—a hospital information management service provider—and Qikwell Technologies Pvt. Ltd, which had expertise in appointment scheduling at hospitals—to enter the enterprise segment. The acquisition of Insta brought about 500 hospitals under Practo’s fold and Qikwell about 250 more. This apart, Practo has expanded its offerings with the launch of clinics, diagnostics, health and wellness, online doctor consultation, and medicine delivery, a move that experts say will help the company keep its consumers glued. It also intends to enter the health insurance segment soon. Doctor consultation and medicine delivery have also helped Practo metamorphose into a transactional platform. For us, going forward, the marketing business will be big, then software and then transactions. All our products are focused on the provider to help them deliver a great experience to the patient- Shashank N.D.
Practo raised $30 million in a Series B round in February 2015 from Sequoia Capital and Matrix Partners India. The big bucks came in six months later when it mopped up $90 million from China’s Tencent Holdings, Belgian venture capital firm Sofina, Sequoia Capital Global Equities, Google Capital (now called CapitalG), Altimeter Capital and Milner, among others. In January 2016, it raised $55 million at a valuation of $600-650 against $500 million during its previous fundraise, amid an overall slowdown in funding. While industry experts concede Practo’s overall dominance, each of its consumer-facing verticals has a number of competitors. “You need a big brand like Practo to push its way through in a category like healthcare, which is not yet evolved and extremely difficult. What a company of Practo’s stature does is it shapes the industry and changes the industry. That phenomenon has happened. Practo’s presence, and the brand, has definitely shaped the industry and hastened technology adoption," says Doshi of Inventus. The doctor discovery and appointment booking segment has seen the emergence of at least 211 start-ups since 2014. As much as $130 million was poured into this segment in the last three years, with Practo receiving the bulk of it. Similarly, 155 start-ups were founded in the medicine delivery segment since 2014, attracting an investment of $91 million. Netmeds leads the pack here, with a $50-million investment. The fledgling health and wellness segment has been pursued by 145 start-ups since 2014, attracting a meagre $25 million, led by former Flipkart executives Mukesh Bansal and Ankit Nagori’s CureFit, which raised $15 million in July last year. Practo is yet to dabble in home healthcare, which has Accel Partners-backed Portea Medical and Eight Roads Ventures-backed Medwell Ventures in the lead. For Shashank, though, the priority is clear. “Core for us is very clear. Help consumers find a doctor and book an appointment. Similarly, for providers, we want to become a trusted partner when they want an IT solution. Be it Enlightiks for analytics, Insta for hospital information management, Qikwell for appointment booking and (Practo) Ray for practice management, that is our core focus and everything else is an experiment. But, we need to do these experiments," says Shashank. And he is not apologetic about shelving some of these experiments, a case in point being the health and wellness category that Practo launched after acquiring health and fitness solutions firm Fitho Wellness Services Pvt. Ltd in April 2015. The company even pruned its workforce by about 10%. About 150 employees were asked to leave in April due to redundancies occurring due to acquisitions and performance required for growth, said a company spokesperson. “We try many things. Some click and some don’t. Wellness and fitness is something which we tried but we need more focus and management bandwidth. It is more on the pause mode. But, medicine delivery is an interesting business because there is a lot of pull from the market," says Shashank. Industry experts say the results of Practo’s attempts might take some time to show, given that digital healthcare in India is still nascent, unlike online retail or ride hailing. Besides, doctor discovery or health consultation, is unlikely to be part of a consumer’s daily schedule. “For this to be understood, you need investors who look beyond the five-year horizon. This is not a three- to five-year game plan. The dividend would be significant if you crack this and get reliable patient data, have significant market share in terms of doctors and you are the go-to platform for anything medical," says InnoVen’s Murali. Practo head offices in Bengaluru. “It may not happen in two-three years, but in 10-15 years, definitely, if they have the capital. Practo will be a special company. But, yes, it also needs patient capital and investors who think long term," he adds. There is reason to be hopeful. According to a report by CBInsights and KPMG, investment in healthcare technology start-ups globally has not taken a hit despite a slowdown in funding. About $3.2 billion each was invested in the sector globally in 2016 and 2015, as against $2.2 billion in 2014 and $1.5 billion in 2013. Shashank admits to the challenges ahead, but maintains that Practo is at the top of its game. “We have our sets of challenges. For example, technology adoption by providers. We face challenges in giving it to them and retaining them. Those challenges are largely around how do we make sure the healthcare ecosystem absorbs such innovation and bring in the behaviour change. Providers are very comfortable in doing things a certain way and to break that inertia is hard. It is a combination of our ability to build a great product and have a great distribution network. When an industry adopts digitization, it will have its challenges. We are ready for it," he says.